Member experiences that may be of interest to the club. The Ohio QSO Party (OhQP) is a contest which I greatly enjoy. It runs a convenient 12 hours over a Saturday afternoon & evening, has clear rules and is sponsored by MRRC. Over the years, I’ve participated in the contest in a variety of ways. Four times, I’ve been a mobile entry, driving around Ohio activating various Ohio counties in my Jeep with a partner. Twice I’ve been part of a multi-operator team from K9TM’s QTH in Sylvania, OH, and twice as a full-time out-of-state entry from my home QTH in nearby Michigan. But my late mother grew up in Akron, OH and I still have relatives who live there south of the city in Summit County. For years, I’ve thought it would be fun to do a portable OhQP operation from their QTH. A family visit three weeks before the 2015 OhQP provided an opportunity to broach the subject with my relatives and scope out their yard for antenna possibilities. My aunt and uncle readily agreed to allow me to come operate from their QTH. They live on an acre lot in a quiet rural setting, and I noticed they had empty flag pole in their yard. It appeared to be only 20’ tall, but was surrounded by open space and would make a perfect dipole support. I paced off the distance (70’) to their nearby garage for estimating the amount of feedline I’d need. The garage was clean and offered a good operating location. My relatives said that mosquitoes would not likely be a problem in August and so my plans for the operation were starting to take shape. I went back to Michigan and started making a list and collecting equipment that I would need for my operation. The first consideration was the antenna. I wanted to take maximum advantage of the OhQP rules which count QSOs on 80M thru 10M, on both CW and phone, with scoring that encourages multi-band, multi-mode operation. At the same time, I didn’t want to clutter my relatives’ yard with a bunch of antennas which would require a lot of time and effort to install and make my operation glaringly obvious to their neighbors. I settled on a G5RV dipole which is 102’ long with a 34’ ladder-line feeder with a run of coax to reach the operating position in the garage. Rather than build a G5RV dipole, I simply purchased one off the Internet from RadioWorks (http://www.radioworks.com). I chose this particular G5RV because the antenna and ladder line were made of stranded wire which would be easier to install and take down in a portable setting. The antenna arrived two weeks before my trip so I hung it temporarily at my home QTH to test it. Being a simple multi-band antenna, the G5RV is a compromise which presents moderate to high SWR on the coax feedline and use of an antenna tuner is recommended. I wanted to see if the automatic tuner built into my Yaesu FT-1000MP transceiver would match the antenna adequately. The Friday morning before OhQP, I loaded my Jeep Cherokee with all the things I’d need for my operation. Besides the G5RV dipole, various lengths of coax, tuner, transceiver, keyer paddle, foot switch, headset and a small tool kit, I brought an Acer mini-desktop computer, keyboard and monitor for logging. I chose the desktop computer vs. a laptop for its bigger screen display, full-sized keyboard and built-in voice keyer for phone operation. Since I was traveling by car, the extra weight and bulk was not a problem and it was nice to have the home station amenities. I packed a card table to operate on, a desk lamp, a box fan (in case it got warm) and a fleece hoodie (in case it got cold). I also packed a picnic cooler with Coca-Cola and a sub sandwich for meals, with some pop-tarts and granola bars for snacks. It was mid-afternoon Friday when I set out on my adventure. It is only about a 3-1/2 hour drive from my QTH to my relatives’, and it was a perfect summer day. Traffic was moderate and I arrived about 7:00 PM, after they had finished supper. After some family chatting, with the help of an adult cousin we had the antenna hung from the flag pole just as it was getting dark. 30 minutes later, the station was set up on the card table, which is when things got interesting. Contrary to the testing at my home QTH, in Ohio the FT-1000MP would not tune the G5RV dipole properly on any band other than 20M. 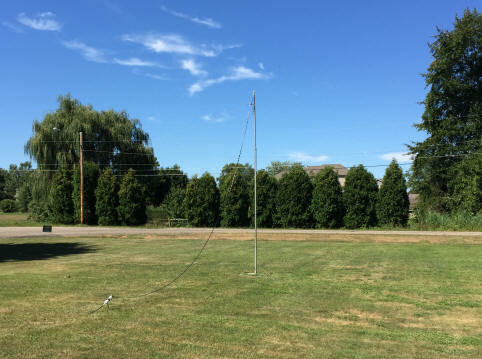 The only differences were that the antenna was about 10’ lower in Ohio, and I had decided to use 100’ of RG-213 rather than RG-58 to reduce loss, but that had also been tested in Michigan before the antenna was taken down for the trip. Switching to a shorter 50’ length of RG-213 did not help. On Saturday morning, I put the MN-2000 antenna tuner in line, and started to pre-mark knob settings for each band-mode. On some frequencies, like 75M phone and anywhere on 40M, the MN-2000 could only match the antenna to about a 2:1 or 3:1 and it was necessary to have the auto-tuner activated to “finish the job” to 1:1. I didn’t have an Internet connection so I didn’t know that there had been a Coronal Mass Ejection (CME) from the sun, I only knew that I wasn’t working many in-state (Ohio) stations. I also didn’t have much experience with such a low dipole to know what to expect. Eventually, as things slowed down on CW I had to QSY up to 40 SSB and while I could get answers to CQs, the rate was slower and I finished the first hour with 47 QSOs. This is where my operating strategy had to reflect the OhQP rules. CW QSOs are worth double points and could be made at a faster rate, but the all-important multipliers are counted once on CW and once on phone, so for best score at times my small antenna station had to crawl along at slow rates on phone to get the phone multipliers. This set the pattern for the afternoon: CW first on a band, then go to phone for as long as its productive. 17Z was only 37 QSOs, mostly 40 phone. 18Z was my first shot at 20M with results similar to 40M; decent rates on CW, phone not so much and a total of 44 QSOs. 19Z it was back to 40M for 58 QSOs, mostly phone. 20Z was a full hour on 40 CW for 38 QSOs. Experience from mobiling in OhQP had taught me that 40 phone can be good in the 21Z hour, a combination of decreasing D-layer absorption and European BC QRM that is not yet audible. I went to 40 phone and yes, it was a little better with rate (20 QSOs in 23 minutes) to go with some QSOs on 20M resulting in 34 for the hour. Up to this point, I had not worked very many Ohio stations and there were a lot of Ohio counties missing on my multiplier sheet. I was hoping that 80M/75M would correct that beginning in the 22Z hour. I went to 75M first, hoping to get there before the band got taken over by the “pig farmers” and other curmudgeonly band residents. I started at the low end of the OhQP activity and worked my way up the band doing “search and pounce”. The rate was only fair, but nearly every QSO was a new multiplier. Eventually, I found an empty hole at 3869 KHz, and started calling CQ uncontested. The result for the hour was 34 QSOs with 27 on 75M, and 15 new multipliers. Experience has taught me that if you can get a frequency on 75M, stick with it until it dries up so the 23Z hour was more of the same. I ran 38 stations during the hour, all on 75M; only fair rate but 12 more new multipliers. The string continued into the 00Z hour for 13 more QSOs before I QSY’d to CW, hoping to repeat the success. The rate there was not spectacular, but 26 more QSOs went into the log in 48 minutes along with a bunch of CW multipliers. 01Z was my best hour of the contest, with 41 QSOs on 80 CW and 31 on 40 CW for 72 QSOs total. For whatever reason (perhaps the dissipating effects of the solar CME), the conditions on 40M were simply spectacular. 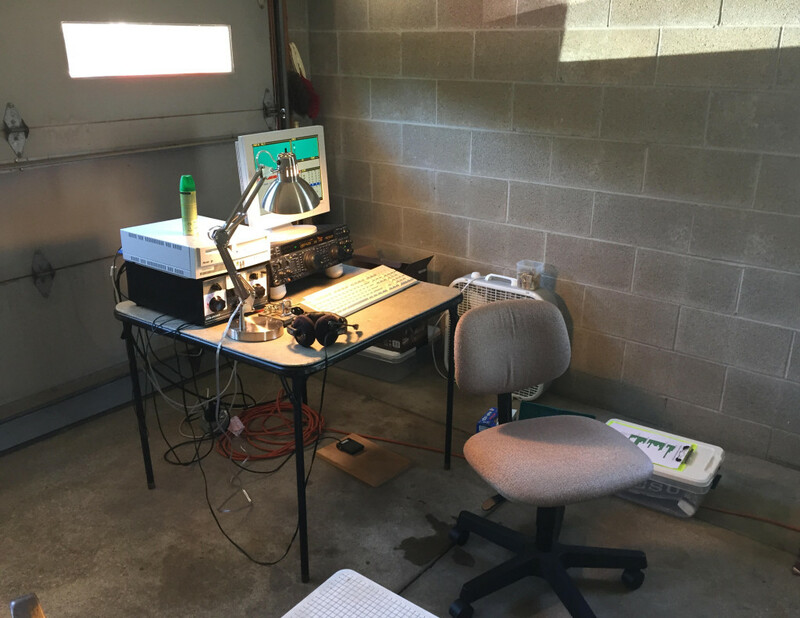 I was working everywhere; eastern stations, western stations, in-state Ohio stations, and another bunch of multipliers on CW. The excellent conditions continued into the 02Z hour for 66 more QSOs on 40 CW and 12 more CW multipliers. For the last hour of the contest, I went to 40 phone for a little while; not many stations but the first five in a row were all new phone multipliers. I went to 20 phone for a little while which still had activity and I hoped to snag some western multipliers (I never did work CA on phone the entire contest) but only three stations and no new mults answered my CQs. I finished the contest on 75M and had a total of 47 QSOs in the hour, all on phone. Overall, I’m pleased with the results which place me fourth among single-operator/low power entries in the claimed scores made public thus far. The old record from Summit County for SOLP entries was 24,288 points, so I think I did pretty well with my little portable station. Comparing the average rates between CW and phone, it would appear that I could have made more QSOs had I spent more time on CW. However, I think the nearly identical multiplier totals for CW and phone are indicative that I used the correct strategy for best score. I would like to do another similar operation in OhQP next year. The only things I would change is to get the antenna a little higher (perhaps using a taller portable mast supported by the flag pole) and a better antenna tuner configuration (perhaps an automatic antenna tuner like the MFJ-927 located at the feedpoint end of the G5RV ladder line). I hope this article gives the reader an example of what is possible with even a simple setup in OhQP, and perhaps inspires them to try something similar themselves in the future.